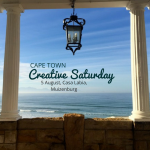 Enjoy a bit of literary fun with All About Writing and Slow Life when we present our Creative Saturday at Casa Labia in Muizenberg. Cost: R300 per session (payable in advance) The price includes muesli or scrambled egg on seed loaf breakfast + coffee/tea on arrival and coffee/tea mid morning. And afterwards please stay on for the launch of The Eleventh Month, an anthology of short stories which were largely the product of a single weekend in November 2016, spent at Temenos, in the village of McGregor in the Western Cape. 12.30 for 1 pm in the Garden Room at Casa Labia for a glass of wine and snacks. The Casa Labia kitchen/bar will also be open should you wish to order anything else. Please let us know if you can make it, and if you’d like to bring anyone with you. Friends and family are welcome.